On October 1, Capalino+Company joined some of the brightest minds in the technology and the mobile app world for the TAP Conference 2015. This all-day event showcased many of the most respected brands, innovators and leaders in mobile technologies. 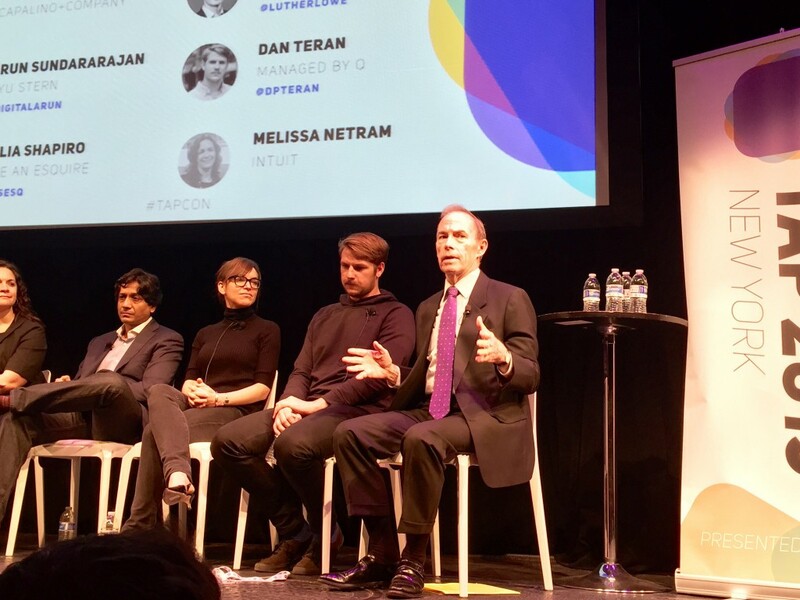 The conference, hosted by Button at New World Stages in Manhattan, featured multiple panel discussions with experts in mobile marketing, user experience, technology, regulations and partnerships who are changing the way consumers navigate their daily lives. Jim Capalino, CEO of Capalino+Company, served on the panel entitled “The Role of Regulation in 21st Century Marketplaces.” As a member of the panel, Jim spoke about how companies can work with Government Relations professionals to better explore how they can help policy-makers enact forward thinking regulation around employment, data, and city planning that will take into account the best interest of all stakeholders and promote a thriving technology sector. Also, how they can help companies, as part of any due diligence exercise map out current and projected regulatory climate at the local, state and federal level. The on-demand economy has immensely disrupted how we do business. With decades of experience helping clients compete successful in the New York market, Jim led a discussion on the intersection between government and the on-demand economy, highlighting the current regulatory environment, challenges of entering the NY market and strategies for growth. While new advancements in technology can be put to good use in the public sector, it can be difficult to integrate because disruptive technology threatens established institutions and markets. The NYC market is attractive because of its size – NY Metro Area is over 23 million people- but the NYC regulatory environment is often outdated, with laws that go back for decades and do not always interact well with new tech. Jim stressed that new disruptors must “wake up and smell the coffee” and pay attention to not only the City and State regulations, but take a look at what is in the pipeline for the next class of regulator to ponder. It’s incumbent for the new market entrant to be aware of regulatory environment and find ways to work within that atmosphere; they’re not immune to government. However, there should also be compromise in both directions – Capalino+Company often helps bridge the gap. The panel also examined employment and labor law, debating independent contractors (1099) vs. full-time employees (W2) in our gig economy. The independent contractor market has grown exponentially with technology and will only continue to disrupt the status quo. Concerns arose that if the innovator model is pushed into full time employment because of regulations, it would be a missed opportunity. Panelists agreed that government needs to create space to organize and develop a new innovator model, and should allow new forms of work to emerge rather than forcing the old system. One of the key takeaways was the smart use of data to shape regulation. Open data can be used in order to find new ways to craft smart public policy and deliver social services more efficiently and effectively. Jim urged companies to share information with policymakers that measures a real impact in order for them to effectively respond to the changes of these new models. “The City can make good use of investment and land use regulation to promote a thriving technology sector,” said Jim. Jim highlighted various digital initiatives from NYC’s Chief Technology Officer Minerva Tantoco and City agencies like EDC’s BigApps competition to promote open data and a thriving technology sector. Despite the regulatory hurdles, the on-demand economy can create job opportunities where they may not have existed before. It can force both established companies and new provides to innovate and create better products for the common good.